This letter was written by Lt. Henry Clay Campbell (1843-1920), the son of James & Elizabeth (Wall) Campbell. Henry was married to Mary S. Davis (1843-1922) in August 1864. 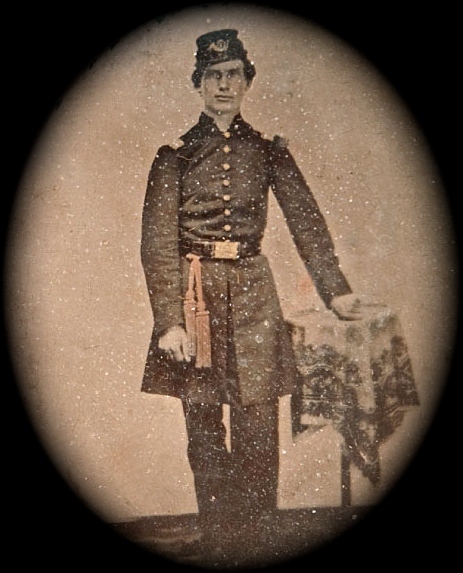 Henry enlisted at the age of 18 for 3 months in Co. A, 105th Pennsylvania Infantry. He then re-enlisted as a corporal in Co. B, 206th Pennsylvania Infantry. He rose to the rank of 1st Lieutenant before the end of the war and, as we learn from this letter, fulfilled quartermaster duties prior to and after the mustering out of his regiment. Henry returned from the war to study law in the office of Phineas W. Jenks and was admitted to the Jefferson County Bar in 1867. He practiced law in Punxsutawney and in Brookville before relocating to New Mexico for three years. He returned to Jefferson County, Pennsylvania in 1883 and then went to Washington D. C. for a couple of years. I am seated this Sabbath evening to reply to a dear letter just received from you. I have written three letters since arriving here and received the same number from you. I am at leisure now more than I have had since I have been Quartermaster as my business is at a stand and will have some rest till after we are mustered out when I will have some work as I will have tents and camp equipage to turn in for the officers which will be considerable work but I think I can do it. I think that by Wednesday we will be mustered out and then we will start for Pittsburg and a few days there and then home. How glad I shall be when that quiet spot looms again in view. To see that loved face, to feel the kind caress of my darling wife whom I have so long been separated from and who I so long to see. I was over to see Dr. Hughes this morning and promised to go back this evening but I loaned my horse and he did not get back for some time and when he did come he was too warm to ride so I waited for another opportunity. The Dr. is well and will go home on a visit sure next week so he says about the time we expect to get home. I thank Father for his kindness in paying that order and I will repay him as soon as I get home, which I hope to be in a very short time. In no unforseen misfortune occurs, you will not have long to wait to see the one you so long to see. I feel the time long till I get home but shall bear the anxiety as patiently as possible and hope though it may prove a few days longer than at present anticipated, the meeting will be more joyous. Would that I could fold you in my arms tonight knowing that there would be no military law to separate us again or civil war to disturb our land. The great object is accomplished and I am now content to rest. I can turn my attention to business without any distracting or startling accounts of war to annoy me. I have no other news to write so I will close hoping that before this reaches you I shall be hastening to where you are. You need not write again for I think that before another letter can come, I shall be on my way home. My love to all. Kind heaven permitting, I will be permitted to tell you more than I can write in a few days. This entry was posted on Thursday, June 5th, 2014 at 7:02 pm	and posted in Uncategorized. You can follow any responses to this entry through the RSS 2.0 feed. Do you have the original letter? I do not. I transcribed this letter for an acquaintance who sold it recently on e-bay (which is generally the case for most all of the letters appearing on the Spared & Shared Blogsites I manage). Thanks, that is a great letter! He actually served with the 105th PA (The Wildcat Regiment was through it all) until August of 1862…his enlistment was for three years, but he was discharged for disability. This was my great-great grandfather. His son, Ralph Eddo Campbell, was my grandfather.